Indigenous representatives from besieged Colombian communities call on Indigenous peoples in Canada for help in their struggle against extinction. APTN Reports. OTTAWA, Canada — The situation of Indigenous peoples in Colombia is so dire, that the UN Special Rapporteur on Indigenous Peoples Rights James Anaya has called for the UN special advisor on genocide to visit Colombia. Last week Indigenous representatives from besieged Colombian communities called on First Nations people in Canada to help in their struggle against extinction. 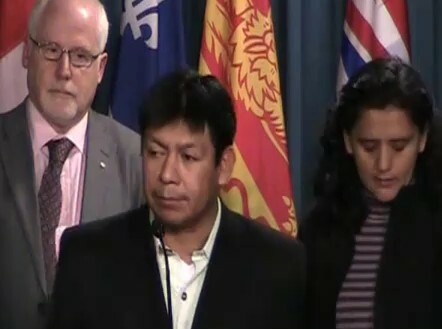 Two representatives from the National Organization of Indigenous Peoples of Colombia travelled to Ottawa Thursday to detail the assaults facing their communities in Colombia which have pushed them to the edge of annihilation, according to APTN National News. Flaminio Onogama Gutierrez, of the Embera, and Dora Tavera Riano, of the Pijao, described how some Indigenous communities have been reduced to 50 people as a result of armed conflict with the military, guerrillas and paramilitaries in the South American country. Many Indigenous communities reside in traditional territories that are rich in biodiversity, minerals and oil eyed by foreign corporations, including from Canada. Between 2002 and 2009, 74,000 people have been forced from their lands and, according to Amnesty International, the displacement is increasing. Onogama Gutierrez said they came to Ottawa with their message because Canada had signed a free trade agreement with Colombia, which includes a side agreement that requires the Canadian and Colombian governments draft annual human rights reports on the impacts of the agreement. The first report is expected in May 2012. Canada has also had strong historical ties to Colombia and Onogama Gutierrez said he hoped the federal government would use its relationship to advocate on behalf of Indigenous people in Colombia. The situation of Indigenous peoples in Colombia is so dire, that the UN Special Rapporteur on Indigenous Peoples James Anaya has called for the UN special advisor on genocide to visit Colombia. Video recorded by Ish Theilheimer in Ottawa for Straight Goods News on December 9, 2010. Watch the video on YouTube. For more information, visit UN High Commissioner for Refugees (UNHCR), Colombia (in English); National Indigenous Association of Colombia (in Spanish); Information site on Colombia’s Indigenous Population (in Spanish). Also see: Colombia: Indigenous Peoples Under Threat; Arhuaco Message to Indigenous Peoples.